Subscribe to Citrus Industry Magazine Today! Citrus Industry magazine is the only “Citrus Only” publication in the state publishing relevant news and information on current issues concerning the citrus industry. For a limited time, receive a free, 3-year subscription to Citrus Industry! International subscriptions $90.00 per year — ALL INTERNATIONAL SUBSCRIPTIONS MUST BE PAID THROUGH A U.S. BANK. WE ASSUME NO RESPONSIBILITY FOR NON DELIVERY OF INTERNATIONAL MAIL. 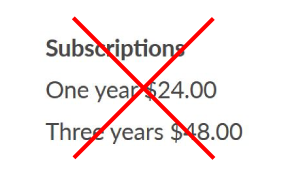 NO REFUNDS ON INTERNATIONAL SUBSCRIPTIONS. REPLACEMENT ISSUE FEE – $12.00 PER ISSUE. DIGITAL DELIVERY IS RECOMMENDED FOR ALL INTERNATIONAL SUBSCRIBERS.